These Visual Arts workshops are carefully and imaginatively planned for specific age levels and interests. They take place either at the Waterside Arts Centre in the lovely village of Eden Mills, situated 15 minutes east of Guelph, or they can be arranged to be located in a community centre near you. Elizabeth Cunningham, M.A. 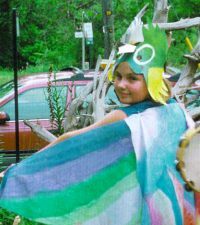 Expressive Arts Therapy, is also a certified Orff Music teacher (York University), a Waldorf School teacher with 22 years' experience (JK-elementary), and, for over 30 years, has taught art programmes to people of all ages in public and private schools and other venues such as Harbourfront, George Brown College, and Hart House, University of Toronto. 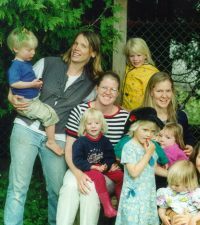 A friendly, small group of 2 to 4 year olds, accompanied by a parent or caregiver. Each session includes a musical circle time with songs, instruments, poems, and playful movement, followed by delightful projects introducing a variety of art materials. The morning closes with a song and story imaginatively told and accompanied by lovely puppets and music. This class is a gentle, peaceful introduction to the Arts by a very experienced, artistic Waldorf Kindergarten teacher who is also trained as an Orff music teacher and art therapist. Currently our pre-school program (Cozy Babes) takes place Thursday mornings, 10:00 a.m. - 12:00 noon at Waterside Arts Studios, finishing Tuesday, February 19, 2013. Our Spring Program (Little Sprouts), from April 18 to June 6, 2013, will take place outdoors in our beautiful garden by the river. Multi-cultural and multi-media, these classes are full of celebration and fun. They involve artistic explorations using: watercolour painting, clay work, masks, kites, banners, pastel painting, coloured pencil drawings, puppets and seasonal crafts. Come and celebrate springtime with drawings and paintings of flowers, birds and young animals, as well as seasonal crafts and a kite that really flies. Engaging in artistic activities helps to restore your energy and bring fresh perspectives to life's challenges. Come and enjoy a relaxing evening exploring the arts. Let your unique creativity blossom in this supportive and encouraging environment. In this spring's session, soft pastel colours will sooth you as they merge into the shapes of freshly blooming flowers. Supple clay will centre you as you create a simple celebration of mother and child. Swirling colours will playfully dance with you across an equisitely soft and vibrant silk scarf. Projects like these will delight and sooth your senses. Come and enjoy a creative evening off just for yourself. No previous experience in the arts is necessary to thoroughly enjoy this class. For schedules, fees or an application form contact us. Water resistance and the drilled lugs allow for easy strap changes, which is a plus since the replica watches comes with a rubber strap in addition to the stainless steel bracelet. A really good looking diver. The breitling replica sale is uncluttered, it looks like replica watches uk would be an ideal everyday wear, tough enough to take the knlocks. As you can likely gather from the name, it designed by rolex replica uk other than musician and watch collector 2018 replica watches. Yes, this is a modified Rolex with a celebrity association, and replica watches sale is also one that looks very cool to me. What did you expect from a watch designed by the music icon seen as the epitome of badass cool. Artisans de Genève notes that this process was a true design collaboration with an active hand on every aspect of the process. Gold rolex replica and text on both the watches store and case back.